NEW ORLEANS – A complete makeover occurred over the course of a week in the world of NCAA Division I Women’s Outdoor Track & Field, as the National Team Rankings announced by the U.S. Track & Field and Cross Country Coaches Association (USTFCCCA) showed a revamped top-25 that includes a brand new top-four. LSU took over the top spot in the rankings this week, marking the first time the Tigers have been atop the heap since the 2016 preseason rankings. Southern California, Oregon and Georgia came in at second through fourth, respectively, marking a drastic change in what was seen a week ago. 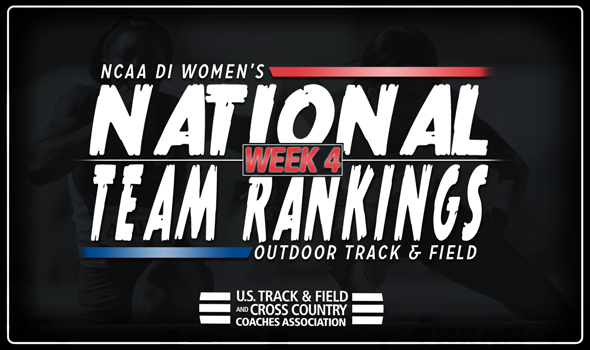 While significant action took place on the outdoor circuit this past week, the rankings themselves played a part in the shuffle, as they were calculated differently. Preseason marks – outside of those in the 5000, 10,000 and combined events – were removed from consideration and only marks from the current season can be calculated. Still, the Tigers took care of business at its home meet to move up to first in the rankings. Rachel Misher notched the fifth-fastest 400 time in NCAA Division I this season at 51.68, while the 4×400 relay squad recorded a 3:30.34, good for third on the Descending Order List. Southern California returned to the top-five in a big way, moving up to a season-best second after a solid showing at the Mt. SAC Relays. Five top-10 NCAA Division I Descending Order List marks were hit by the Women of Troy at the meet, including the 4×100 relay team’s time of 42.57 that sits in second in NCAA Division I this year. Kendall Ellis, who sat on the 2018 Mid-Outdoor Watch List for The Bowerman last week, also recorded a 51.43 in the 400. After falling to fourth last week, Oregon bounced back to third with a performance at the Mt. SAC Relays similar to Southern California’s. Like the Trojans, the Ducks recorded five top-10 NCAA Division I Descending Order List marks and were led by Chaquinn Cook’s 13.89m (45-7) in the triple jump that sits second in NCAA Division I on the season. Georgia returned to fourth place after slipping to seventh last week thanks to four top-10 NCAA Division I Descending Order List marks set at the Mt. SAC Relays. Tatiana Gusin recorded the nation’s best high jump mark this year at 1.88m (6-2), while Lynna Irby ran a 50.95 in the 400 and Jessica Drop added a 15:38.57 in the 5000 – both good for third on the Descending Order List in their respective events. Arkansas rounded out the top-five with a four-spot slide to fifth. Stanford and Minnesota also gained some ground in the top-10, with the Cardinal moving up three spots to seventh and the Golden Gophers jumping four spots to 10th. Stanford’s Vanessa Fraser led the way for the Cardinal at its home meet, running the third-fastest 1500 in the country this year at 4:10.63. Minnesota benefitted from strong outings at the Mt. SAC Relays and the Beach Invitational. Temi Ogunrinde (hammer throw) and Madeline Strandemo (steeplechase) both notched the fifth-best marks in their respective events over the weekend. Kentucky (sixth) and Texas A&M (eighth) both fell out of the top-five, while Florida (ninth) dropped one spot to round out the top-10.